Don't sing with a fake British accent, don't act like your family's a joke. This song, written by Jason Isbell when he was part of the band The Drive by Truckers, creates a story from life messages that his father passed to him. More than any academic account I have read, it encapsulates the lessons that the working-class men I interviewed about the ongoing impact of deindustrialisation on male work identity in the UK taught to their sons. To 'not call what you're wearing an outfit' is a variation of the southern American working-class value 'don't get above your raising'. While in Britain there is a similar phrase, 'don't get ideas above your station', I think the American expression is more useful as it makes a direct link to family judgement, while 'station' has a more open social meaning. In his book 'Don't Get Above Your Raisin': Country Music and the Southern Working Class, Bill C. Malone suggests that this expression 'is not an injunction against wealth as such, even though riches carry the potential for corruption. Instead, it is a rebuke to pretense and snobbery, and a plea for respect for and loyalty to ones roots'. While this song reflects a loyalty to family and background, it also expresses a father's desire for his son to not repeat his hardship or employment, as the father warns his son to not repeat his work as a house painter by saying: 'don't let me catch you in Kendale with a bucket of wealthy-man's paint'. This multifaceted narrative suggests the son should not repeat his journey but also should not forget the integrity of his working-class background. The tension of balancing individual and family identities is not new or an exclusive feature of working-class male familial relationships. However, deindustrialization made, and is still making, the negotiation of family background a more practical issue, as industries that for generations had been a staple resource for producing and reproducing working-class culture and identity have now closed or gone into rapid decline. The generational sentiment: 'don't repeat my journey and don't forget the integrity of your working-class background' I heard from many of the fathers in my own study. These men had worked at the Chatham Royal Dockyard, a naval ship-building and maintenance yard officially established by Elizabeth I in 1567. This 400-year history meant that many workers could trace chains of their families working in this industry for hundreds of years. The dockyard closed in 1984, leaving most of its 7,000 employees having to search for new jobs, an event that inevitably created feelings of anger or despair. Twenty-seven years later, I wanted to explore the long-term effects of that closure on men who had worked in the 'dockyard', as well as on their sons and grandsons. The majority of British studies on deindustrialisation have focused on unskilled men, but I wanted to understand how deindustrialisation had affected skilled men. When I asked 13 former Royal Dockyard skilled tradesmen and 14 of their sons and grandsons about their career choices, many said something like 'I did it to get on'. The phrase 'to get on' seemed short hand for making career decisions with an aim to achieve upward career mobility and better job security. For these men, the value of 'getting on' seemed to have a deep family history rooted in industrial society. The first generation, for example, discussed this desire for upward mobility as the reason they pursued a trade or craft apprenticeship. In fact, their parents saw a trade as offering a better and more secure job then they had been able to secure as unskilled workers. One of the men I interviewed, Francis Copper, for example, recalled telling his father he wanted to go in the navy. His parents persuaded him that this was not the best path. As his father said: 'You shouldn't do that, go in the Dockyard and do your apprenticeship and when you've got your indentures you can do what you like'. Although most sons suggested they did not passively follow their parents' advice, when the dockyard closed and they lost their jobs, the idea of 'getting on' motivated them to navigate their new jobs for the good of their family. Jerry Naylor, another man I interviewed, discussed moving from being a network maintenance engineer into management at a national phone company: 'My second daughter being born pushed me to move up and get more money'. As parents themselves, these men also stressed the value of 'getting on' to their sons, encouraging them to go into secure white collar work instead of following them into a trade. As Francis's son Chris recalled, 'Dad thought I should go into a bank and be a manager'. Since most of the men in my study actively pursued middle-class work for economic reasons, 'getting-on' as a value could be seen as a contradiction of 'not getting above your rising'. However, in moving into more middle-class paid work, men did not forget where they came from or lose their engagement with their background. Instead, they retained and continued their trade learning and hands-on work by developing unpaid DIY projects. For example, Darrel, a former shipwright, and his son Noel Carrin showed me the architectural drawings and the two-storey extension they had designed and built together. Similarly, Dominic Draper showed off his hand-carved bespoke wooden kitchen. These non-paid DIY projects seemed to allow men to sustain a story to their lives and a sense of integrity with their skilled working-class backgrounds. As Chris Copper reflected, 'We've always been a hands-on, practical people. If I didn't know how to do it, I'd ask dad'. Like Ben Steel, a former boiler maker, most men could not abide 'getting a man in to fix something'. Therefore, in spite of what these men now did to earn a living, they still defined themselves as 'practical people', not above or removed from the virtue of their backgrounds. Like Jason Isbell's father, these men were disciples of the philosophy 'don't ever say your car is broke'. 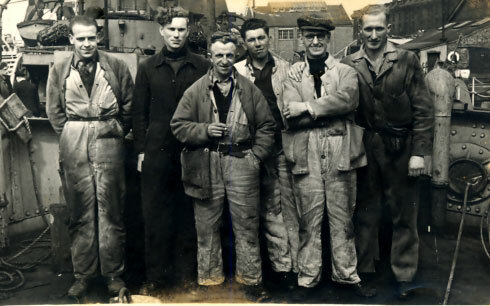 DIY both allowed these men to continue their hands-on trade labour and was a powerful illustration of their commitment to male working-class identity. Much like Isbell, the men in my study were encouraged to move away from working-class occupations. Moreover, due to the deindustrialization process, dockyard trade work ceased to be an option for them. We might assume that this would cause them to lose their engagement with their background and loyalty to working-class values. However, as these men navigated change, they consistently sought to embed these values in their family history. Collaborative domestic repair projects anchored their personal story in their manual trade backgrounds. These projects provided a practical demonstration that, although they had moved away from working-class employment, they had not "got above their rising" (or upbringing as we say in England). So even those who went into careers such as social work or school teaching saw these new spheres of work as relevant to their occupational or family background. These projects also allow them to transmit the value of working-class trade work to their own children, a practical manifestation of 'don't act like your family's a joke'. George Karl Ackers is a senior lecturer in sociology at the University of Portsmouth. His research centres on the sociology of deindustrialisation. To read more about this project, see "Rethinking deindustrialisation and male career crisis", British Journal of Guidance & Counselling, 2014.